Exercise is not a four letter word… its eight and no that does not mean it’s twice as bad. Exercise is good for you, but that is not really a mystery. What may be a bit of mystery is how essential it is for the elderly to exercise. The Centers for Disease Control and Prevention (CDC) reported statistics on physical activity in seniors. It found that only 38.5% of men, 65 to 74 years old exercised regularly, and only 31.1% of women in the same age range exercised regularly. 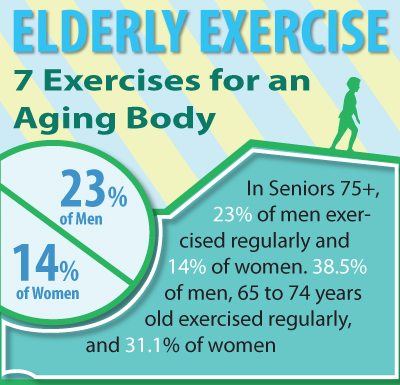 The numbers continued to decrease for the elderly 75+ to 23%of men exercised regularly and only 14% of women. Exercise is vitally important for seniors because it can help with many medical conditions like, high blood pressure, obesity, colon cancer, diabetes, Alzheimer’s and dementia. These medical risks only increase as you age and is why it is essential for seniors to be more active in their later years. Exercise can also help with other aliments you might not have thought of. Thomas Turgeon, MD, assistant professor of orthopedic surgery at the University of Manitoba, Canada, presented a study of 1,247 patients of varying weight who underwent primary hip replacement. In this study patients with a body mass index of 25 or more (under 24 was normal weight) took twice as long to recover from surgery and twice as likely to end up in a skilled nursing facility afterwards. Recovery time is not the only good reason for regular exercise and weight. Depression among seniors can be a very serious issue. The suicide rate among white men over 85 is the highest in the country. The University of California did a study with a senior depression group where they introduced tai chi, a Chinese martial art that incorporates low impact movements. The group experienced a greater decrease in depression, as well as better memory and cognition and more overall energy. Diseases and medical conditions are not the only troubling issues in seniors that can benefit gravely by exercise. One of the leading causes of hospitalization in the elderly is problems that result from falling. Falls account for 25% of all hospital admissions, and 40% of all nursing home admissions. 40% of those admitted do not return to independent living. Most falls in seniors is a result of a decrease in balance control and their ability to brace for an impact. Exercise can significantly increase seniors balance and control. The reasons why exercise is important for the elderly might be quite prevalent now, but what about the actual exercises. To start it is best to establish the parameters. Be sure there are no medical conditions that would inhibit your ability to perform the exercises, consult a physician if needed. Now for the routine, it would be best to exercise at least 30 min a day. This does not have to be 30 minutes continuously in the beginning. You can try parsing it out in 10 minute intervals 3 times a day and work your way up. As mentioned earlier, Tai Chi movements can be great low impact exercise that can improve balance and fitness. 1. While in a standing position. Place your arms out in front of you with wrist limp and your palms facing down. 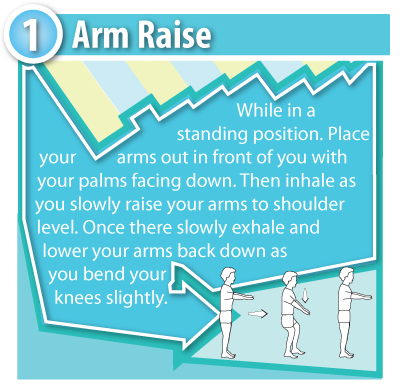 Then inhale as you slowly raise your arms to shoulder level. Once there slowly exhale and lower your arms back down as you bend your knees slightly. 2. 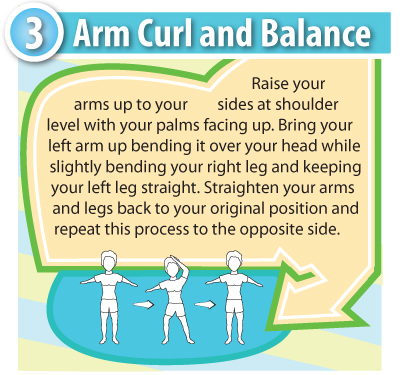 Much like the previous exercise, place your arms out in front of you with your wrist limp and your palms facing down. Inhale and slowly move your arms out to your sides, while slowly bending you’re your knees. Then slowly exhale and bring them back to the center while straightening your legs. 3. In this exercise you will start by inhaling while raising your arms up to your sides at shoulder level with your palms facing up. In a fluid motion, slowly bring your left arm up bending it over your head while shifting your weight to your right leg as you slightly bend it. Be sure to keep your left leg straight as you slowly shift your weight. As you exhale slowly straighten your arms back to your sides at shoulder level and shift your weight back to being balanced on both feet. Repeat this process to the opposite side. 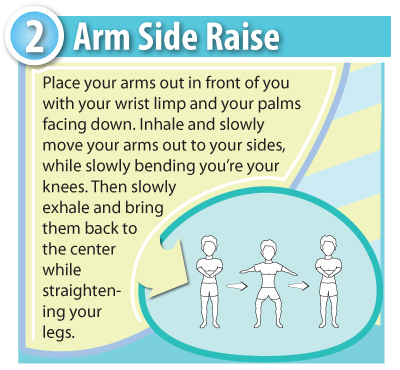 Using a chair to exercise can be a great way to help stability while performing exercises. It is also a great bit of equipment that you most likely have around the house. Be sure the chair you use is sturdy. 4. 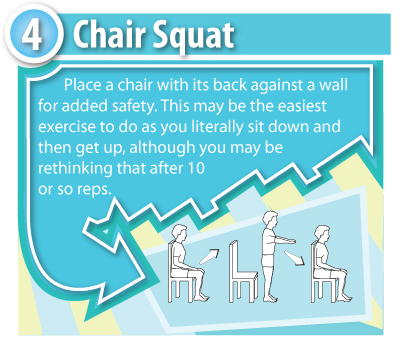 For this exercise be sure to place your chair with its back against a wall for added safety. This may be the easiest exercise to do as you literally sit down and then get up, although you may be rethinking that after 10 or so reps.
5. For this exercise you will use the same chair with the back against the wall, but you will also need a small box or similar item. Place the box on the floor in front of the chair and place your self in a sitting position on the chair. With the box directly in front of the chair slowly lift one of your legs and tap the top of the box with bottom or tip of your shoe. Alternate doing this with each foot for about 30 to 60 seconds each session. 6. 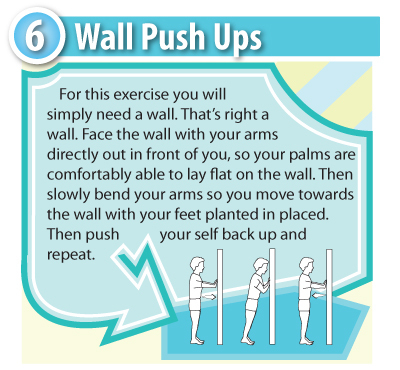 For this exercise you will simply need a wall. That’s right a wall. Face the wall with your arms directly out in front of you, so your palms are comfortably able to lay flat on the wall. Then slowly bend your arms so you move towards the wall with your feet planted in placed. Then push your self back up and repeat. Walking is always a good exercise especially for the elderly. It is easy, low impact and can be a nice way to get out of the house. 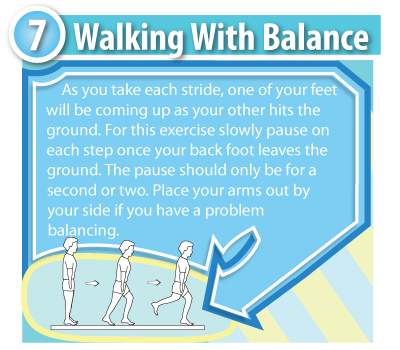 Here is a way to take a walk and improve your balance at the same time. 7. As you take each stride, one of your feet will be coming up as your other hits the ground. For this exercise slowly pause on each step once your back foot leaves the ground. The pause should only be for a second or two. Place your arms out by your side if you have a problem balancing.